We sure can’t complain about the warmer winter weather we’ve been having, but we CAN complain about all the mud. Keep your home and car mud free with these 3 wonderful products made just to make our lives cleaner—simpler! Mud Magnet® paw cleaner keeps the dirt outside from coming in! When dogs come indoors, they bring water, dirt and grime with them. Now you can quickly clean your dog’s paws before getting into your car or going indoors. The Mud Magnet® is made of super absorbent Microfiber material that holds up to 6 times its weight in dirt and water. Unique 2-in-1 design converts from a glove to a mitt. Quick drying – hang by the loop to dry between uses. You know the scenario far too well: you’ve just bathed your dog but before you can towel them dry he unleashes a mighty shake that spews water droplets everywhere followed by the on-the-back-full-body wiggle on your carpet, sofa or bedspread. It appears that our wet pet is enjoying themselves as he shakes, rubs, and rolls all over the house. They do this because they just don’t like to stay wet. Our pets, like us, want to be dry, cozy, and warm. 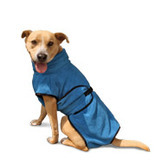 FUR Dry is a patented dog drying wrap that addresses the nuisance of wet dogs. Made with special microfiber fabric, the FUR Dry rapidly draws water away from a dog’s coat and into the material’s absorbent fibers. FUR Dry wraps are available in five adjustable sizes, from extra small to extra-large, for dogs of all breeds and ages. Each of the “noodles” in the Soggy Doggy Doormat® and Soggy Doggy Super Shammy is made from millions of textured, ultrafine strands woven together, so the surface area of these products is much greater than meets the eye. The expansive surface area is the secret to microfiber chenille’s tremendous absorbing power and super-fast drying! The microfiber chenille blend allows the Soggy Doggy Doormats® and Super Shammys to soak up water and dirt like a sponge! The doormats absorb 5x more water than regular cotton doormats and the Super Shammy can hold up to 7x its weight in water. The material is exceptionally hard-working and goes right in the washer and dryer. But the chenille also makes it velvety-soft and gentle under delicate paws and bellies. We are featuring a lot of great discounts on Nature’s Variety food—raw and kibble. $3 dollars off new chubs and patty packs. Nature’s Variety is a small, independent pet food company located in Lincoln, Nebraska. Our team is passionate about providing proper, holistic nutrition for your beloved dog and cat. We believe the best nutrition comes from healthy, natural ingredients. We know all about natural foods – the Nature’s Variety line was developed by families who have been practicing sustainable agriculture for more than 140 years, raising quality livestock and growing crops in America’s heartland. Our wholesome foods are made with integrity and care. We stand behind our products with a 100% satisfaction guarantee. This Thursday, February 2nd Dr. Deanna Witte with Witte’s Natural Veterinary Care will be at the store to do consultations and chiropractic adjustments for your dog. You can also make an appointment for a holistic consultation with Dr. Witte to discuss holistic options for your pet (nutrition, supplements, essential oils etc…). Veterinary service providing traditional and alternative treatment options for your pets. Services include spinal manipulative therapy, wellness exams with individualized vaccination schedules, medical treatment, aromatherapy/therapeutic oils, western herbs, nutrition counseling, and whole food supplementation. Appointments are for 20 minutes and include a consultation and adjustment. Call the store to reserve your spot: 262-363-3338. Happy Groundhog Day on Thursday!